Apple as a brand never fails to surprise you and apple as a product never fails to offer better solutions with its every upgrade in the iOS. One such sublime change apple embraced in its iOS11 – HEIC. First things first, HEIC (High-Effeciency Image Format) is the new image format Apple has shifted to for the fact the new image format consumes just 50% of memory space as compared to traditional JPEG format and it could not have been possible with out their refined compression technique. With each architectural innovation comes a path breaking solution, the solution, HEIC, is now available on iOS devices with A9 processors and higher versions of it. Which means, starting from iPhone 7 and the forthcoming devices will put an end to saving photos on JPEG or any traditional format and will switch to saving on HEIC format. Now that, HEIC format comes by default, images can be shared on facebook, messenger, whatsapp etc with out much hassle, but the glitch welcomes you while viewing the images on your Mac book. 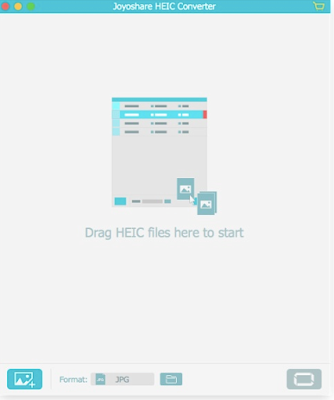 The reason being, HEIC format is not compatible for viewing images on your Mac machine. Now how to view HEIC format images on Mac? We bring you Joyoshare HEIC converter for Mac that converts HEIC format pictures to JPEG/PNG/BMB,GIF,TIFF formats that are compatible for viewing on mac. We have installed and tried converting images, and the results are breath-taking. We do recommend you to download the trail version and try out the software. 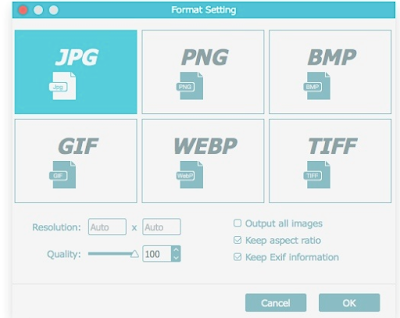 Also, we feed you with the process of converting images using HEIC converter toJPG and other formats as well. You don’t have to worry about picture quality, Joyoshare HEIC converter software will convert HEIC photos to JPG, PNG, BMP without picture distortion. Download and install the trail version on your mac. Open the application, with out paying much attention to reading manual or instructions, to convert convert HEIC to JPG on Mac right from the word go. The home screen should look like the below snapshot. Choose the destination on your mac to store the converted images from the preferences menu. And at the bottom of the window you get to see image format to which you wish to convert. You can actually play with the resolution and the level of quality you want to have for your converted images. Ensure, the HEIC images you want to convert are on your local machine but not on cloud. Click on Import option at the lower-bottom of the window or you can actually drag and drop images. Once the image reaches the converter, the current resolution of the picture pops up, now click on bottom-right option to convert the image. Thus far, Joyoshare HEIC converter is the best best solution to convert HEIC to JPG, PNG, GIF and more. Interestingly, Joyoshare HEIC converter is capable of converting multiple images at one go, ooh yeah! Just in no time. Quick, very quick in deed. We have tried other softwares in the market and our verdict – Joyoshare HEIC converter is the most efficient HEIC to JPG Converter with zero loss quality. When it comes to effecienty, Joyoshare HEIC converter is the best in the market, when it comes to effectivity, yet again, Joyoshare HEIC converter tops the cards with its efficacy to fastly convert HEIC images to JPG, PNG with two modes in seconds. If you own a mac book and using iPhone 7 or later versions, you got to have Joyoshare HEIC converter installed. As an ending note we give you the links to download trail version and premium version of Joyoshare HEIC covnerter. Screen casting or recording is one essential feature required for any kind of computer user today. It is important that this feature is utilized well irrespective of the software that you use on your computer. As Windows has not yet introduced the native screen recording software yet, it has become compulsory to pick a third-party software. 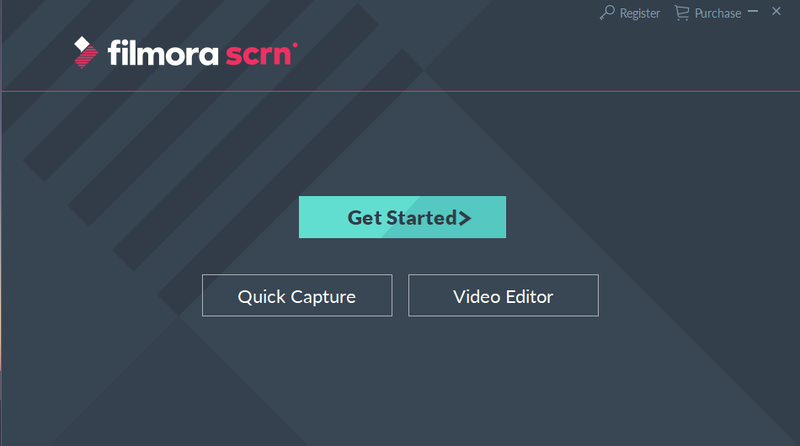 We have come across a latest screen recorder software lately, named ‘Filmora Scrn’ developed by Wondershare. Wondershare is famous for its video editing software solutions. 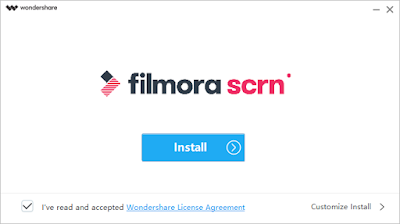 If you have been into video editing or YouTubing, you might have come across the name ‘Filmora’ from Wondershare already. 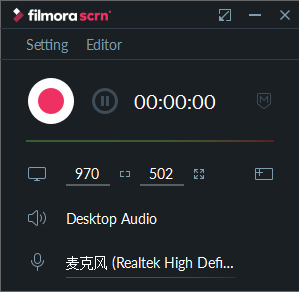 I did not expect much with Filmora Scrn though it is from Wondershare with proven stand in the video editing software business. But, it actually surpassed my expectations. Filmora Scrn offers great customization settings before even recoding the screen or an application. Ranging from the ability to record from 25FPS to 120FPS, this simple tool simply amazes me. Step 1: Filmora Scrn is available on Wondershare’s official website and you can download it from this link. After downloading the setup file, run it. Step 2: Click on ‘Install’ button and wait until it finishes installation. Step 1: After installation it will show a welcome screen with ‘Get started’, ‘Quick capture’, and ‘Video editor’ options. Click on ‘Get Started’. Step 2: It will show four modules of settings, ‘Screen’, ‘Audio’, ‘Camera’, ‘Advanced’ on this screen. Step 3: Select a section you want to customize the setup. The selected section will show a pink tick mark on its tail. The screen recording can be setup to record the full screen, custom size or a particular application. 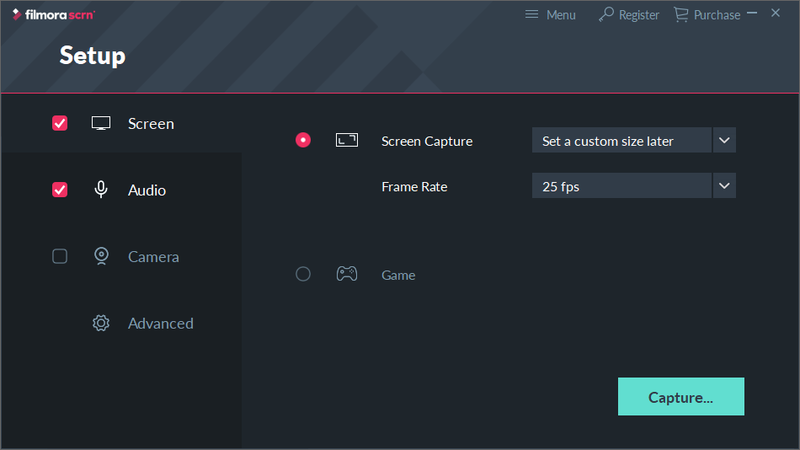 Step 4: Setup your screen ratio and frame rate in case of screen recording. In case of game recording, select the ‘Game’ radio button and pick your gaming application from the drop-down of all running windows on your computer. You can set to record the game up to 120FPS. Step 5: Setup your audio settings here. You can choose to have desktop audio and microphone audio in the recording. Step 6: Choose your web camera here. If you are a YouTuber and you have a camera to record self in the corner side of the screen recording, you should set it up here. Step 7: The advanced settings section has three segregations again, ‘General’, where you show it the path to save the recording and option to GPU acceleration. I would recommend not to use this unless you have a dedicated graphics memory on your computer. This acceleration won’t be necessary for a normal screen record. If you are using this tool to record your gameplay, then you may use this option. Choose correct encoding and hotkeys in the next two sub sectional options. Make sure the hotkeys won’t get conflict with the other software shortcuts. You can also use 'Quick capture' option to capture the screen with default microphone and camera settings. However, the quick capture will allow you to choose the microphone and camera from the connected devices. 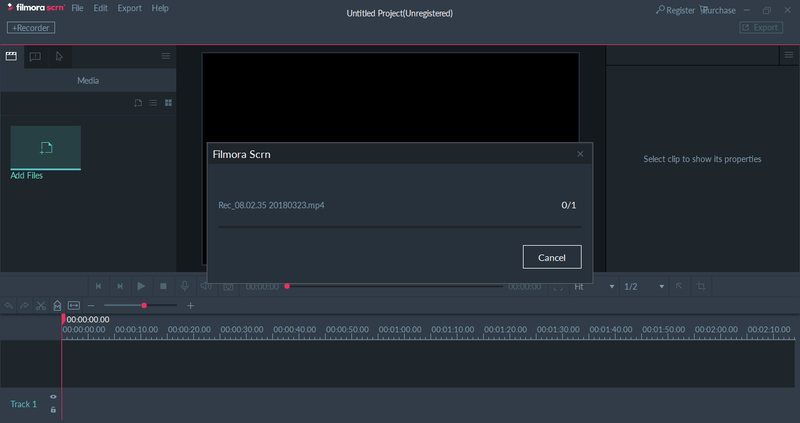 Filmora Scrn opens up the recorded video in a simple editor. 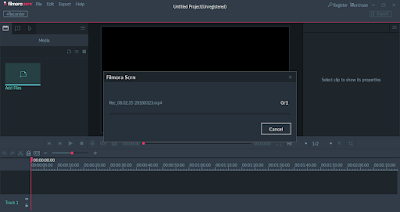 I expected that it would open up in Filmora video editor studio for more control over editing. It hasn’t asked me to choose Wondershare application to edit it in. The screen reorder video is a simple editing tool. You can cut, copy and combine it with music tracks if you want. It offers a timeline with layers of editing for basic editing operations. This video editor have various annotations to use on the recording. It contains captions, arrows, overlays, bubbles, banners and cursor effects which are useful to emphasize a specific part of the frame. In case of tutorials, they are useful to make the viewers understand well. Filmora Scrn video editor offers two wonderful blur effects called 'Horizontal Mix' and 'Vertical Mix' to shade out the elements of the video with less patched look. If you observe the below screenshot, you would not notice where I applied this effect. There are opacity settings and blending mode to edit the video to the context of the content. The voice-over of the video can be detached and replaced by the newly recorded audio with few clicks. After finishing editing, you can directly upload the video to YouTube, Facebook, Vimeo and Twitch. Obviously, you can save it different formats onto your local computer and do the uploading later if you want. However, the recorded file will be saved as .MP4 file which can be imported into Filmora Video Editor or any other video editing software separately and can be edited in that environment. I liked Filmora Scrn’s ability to record screen with needed customized options. The editor is what little bit disappointed me as a video editor and a YouTuber. 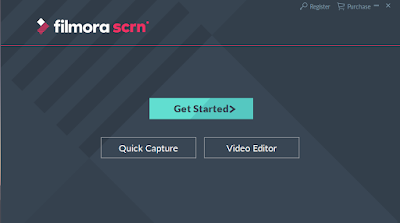 If you have Filmora already on your computer, the ‘Scrn’ would become a perfect companion for your requirement. Online monetization has become the major trend in the digital environment and now it’s possible to monetize almost everything. And I mean… Everything. All the digital entertainment is almost built on these bones and keep growing. So, you have a website on your own, you worked so hard to build up your audience. Now it’s time to think about earning some extra from your website audience or even make it your lifetime earnings. Finding a monetization solution may seem you an easy-peasy deal as the Internet is trashed with them. But, it may become not so simple as it looks. There are a lot of ephemera advertising networks that closes with the full amount of your earned money, there are a lot of scam advertising networks that don't even pay. The easiest and the most popular monetization solution among the publishers is Adsense, a high-end Google monetization solution with an overwhelming mass of rules that make you feel like under a sword of Damocles. 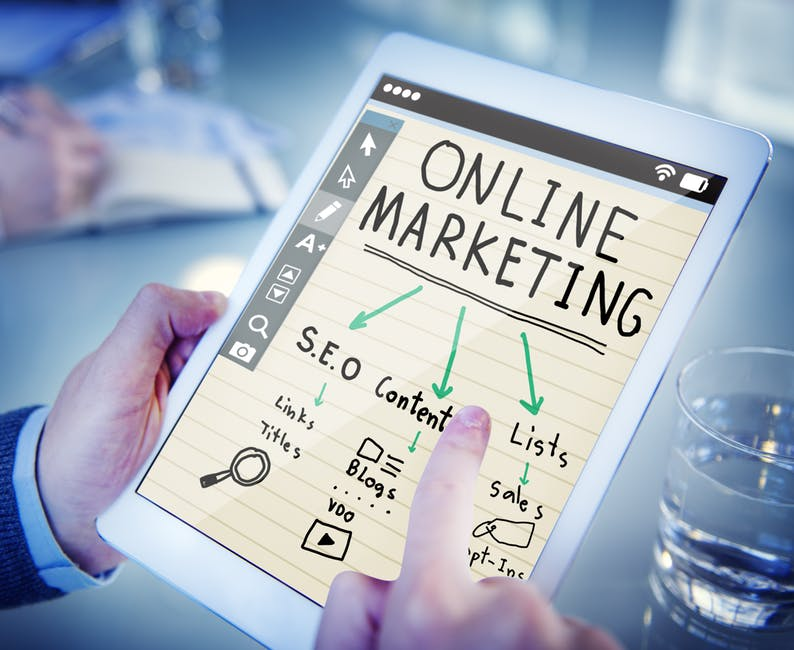 Advertising and affiliate networks are the second popular monetization solutions but they are most stable and can become as profitable or even more profitable than Adsense. What’s pops and how to cook them? What do you imagine when you hear pops advertising? Something irritative? Well, you shouldn’t. It should sound like a jangling of coins because there it is: a mother lode. Just a few words: It’s profitable. While some webmasters doing $8 a day with banners other resourceful webmasters doing $100 a day with pops. Pop advertising is worth every penny. There’s one thing you should stick to: To avoid mass audience irritation you should take it easy on pop-ups or just skip to… Popunders. They just pop under the main browser window or creating a new tab and it’s less irritative than a bunch of windows keep popping in front of your website users’ screen. They definitely don’t deserve this. Where is the money, Lebovsky? The solution is out there. 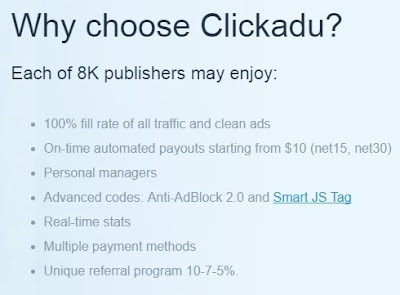 I am pleased to present you Clickadu - a premium advertising network, specializing in popunders. Established in 2014 they have grown to a massive advertising net with 4500 active publishers and still continuing to grow. What’s so great about Clickadu? First, an eye-catching thing is support. I know that you’re interested more in hearing that money-thing but support is really doing great and every question or suggestion can be solved right away with your personal manager or support team. And now, a gold bag. The minimum payout is $10 what is good for small-traffic websites and your earnings can be withdrawn twice a month or by request. It’s good to see a variety of payment methods even the popular crypto BitCoin. What are they paying for? 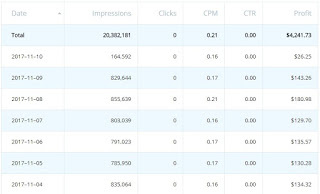 The basic model is CPM (means per 1000 ad impressions), that’s a way more profitable than banner CPC/CPM. 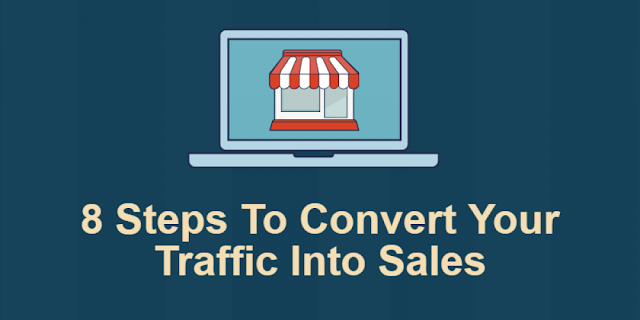 For high-demanding traffic, the CPM could raise up to $14 or even more. Constantly updating Anti-Adblock code could help you to earn 20% more. Handy Monetization Platform makes it easy to monetize your website. The statistics update every hour and there you can filter your earnings as you wish: by date, by a website, by ad zone etc. That sounds a little too good to be true. But it is, except that you can’t monetize a website with 36 daily visitors. Still, you need to work on a traffic quantity and quality to earn more so be patient there. Those two ‘q’ can lead you to the success affiliate marketing. Here’s a small tip over here: Never watch CPM column as it’s just a… Number. The main thing here is profit. You definitely should even if you’re still questioning your success. No one bites you if you try and at the end a humble or not so bounty is waiting for you. 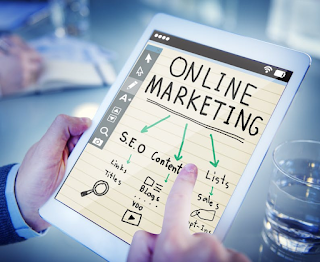 Double your earnings with website monetization. Good luck on your way to the pop! Mobile Number Portability is one of the best surfaced schemes of TRAI to encourage the right to chose a network ove the same number. This is actually a wonderful feature that will allow an user choose among the networks accoding to his requirement. Do you think you mobile number is unique and cannot be used from different IMEI numbers at the same time? You are wrong! Yes! One number can be used from different mobile phones and telecom companies are just hiding this possibility. Even I thought the same till this morning but a major flaw in their networks transportation exposed a serious bug in their network gateway. I had been Idea’s loyal customer for the past 10 years and due to the prolonged interruption of the network in my area, I switeched it over to Airtel 5 months ago. I saw the same problem with Airtel these days and I thought I’d switch back to Idea. So I went to a retailer and submitted my proofs and got an Idea SIM card (under MNP applicaiton). I had to wait for Airtel to go offline forever to insert Idea SIM card for the activation process. I did not get any service turn off from Airtel but I got a message showing that Idea has been activated. No I have two SIM cards, fully functional and active from both the networks. Yeah! Thats’s what scared me. There might be an issue in the common network gateway that these telecom companies are using. This duplicated my number onto another electronic chip which is a major bug in their gateway software system. This either should be updated or looked after to avoid further damage to the user identification. With an out-of-service SIM card in hand and a newkly activated SIM in phone, anyone would feel the swag of a boss throwing it away into the bin or on road. Imagine the possibilities if someone picks up the SIM and puts it in his mobile phone and uses it since it’s active and fully functional. If you want to dispose the old SIM card, break it into two and throw it away. That’s the best you can do. But..What about the duplicate identity? This somehow creates a worry abuot the identity security of our own. If someone could clone a SIM card which would be under our identify proofs and uses it for any anti-social activity or to destroy the personal reputation, may be they can. Telecom industry should take this issue seriously and make sure this won’t happen. If this bug can give a notmal personal like me the access to have both networks active with one single number, it’s enjoyable to have multiple network access but not secured as of now. Beware about the SIM cards till eSIMS come into real market. Stay safe!